Changing Lives & Transforming Communities for JESUS CHRIST! 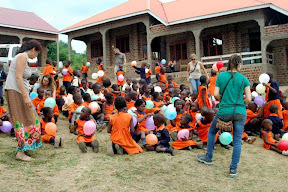 Living Hope Uganda welcomes you for a mission trip to Uganda this coming summer. Come and see the other side of the world or serve with us. We have so many activities aiming to build God's Kingdom within and outside your thinking; at the orphanage school, Homeless Home for Street kids, Widows and single mothers, youth and churches in in the upcountry area of Uganda. If you're interested please, lets know your area of interest; be willing to meet & share with orphans & street children, help in planting churches, train any vocational skill you know to the women & youth, and do you how much you can impact a community with your coming through workshops, counseling, etc. We're waiting for you. Join us to "live & enjoy your mission". Would you want to go for safari while you are here? Yes, we can help you make reservation for your safari and see the beauty of our country which is well known worldwide, The Pearl of Africa. You can see the wild life Uganda is endowed with at a cheaper cost. A mission trip is one of the most powerful spiritual experiences you could take in your life, and we hope you will prayerfully consider taking part in it. Jesus said we must serve others. When you participate on the mission trip perhaps you will have an encounter with Jesus. On a mission trip we get away from what is normal, the comforts of our homes, the familiar neighborhoods and the normal cultural experiences, and we get to experience the true diversity of God's Kingdom. Getting away from our comfort zones into unfamiliar neighborhoods makes us to realize that Christ is our common tie who bind together all people.